©2015 Takashi Murakami/Kaikai Kiki Co., Ltd. All Rights Reserved. 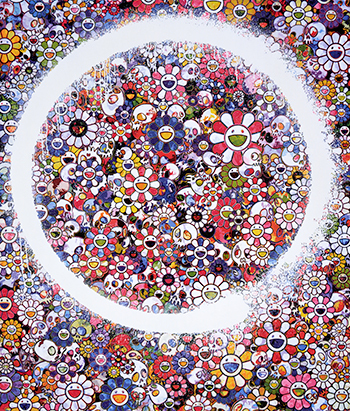 Galerie Perrotin is pleased to organize “Ensō”, a Pop Up exhibition by Takashi Murakami at Kaikai Kiki Gallery, Tokyo. The exhibition will run concurrently with “The 500 Arhats,” a retrospective of Murakami’s work organized by the Mori Art Museum, which will be on view from 31 October, 2015 to 6 March, 2016. “The 500 Arhats” is Murakami’s first major solo exhibition in Japan in 14 years. With “Ensō”, the gallery will feature a selection of paintings from Murakami’s “Ensō” series. The subject of these new paintings is one of the most famous motifs in Zen painting, the Ensō (literally circle) that symbolizes emptiness, unity and infinity in Zen Buddhism. Recently, Murakami has also painted the great figures of Zen Buddhism: Daruma the Great, the founder of Zen; the severed hand of the monk Eka (Huike), a sacrifice to his master Daruma (Bodhidharma) whom he later succeeded; and more recently, The 500 Arhats, in a 100-meter long painting representing the 500 wise followers of Buddha who attained enlightenment by overcoming their greed, hatred, and delusions, and destroyed their karmic residue from previous lives. Murakami painted The 500 Arhats in response to the 2011 East Japan Earthquake and Tsunami, an event which profoundly changed the direction of his work. The Ensō paintings represent another epiphany for the artist, resulting from quiet and ongoing spiritual practice. The Ensō is the prerequisite to every act of creation, a moment when the mind is free to let the body create. Traditionally traced with a brush in one fluid and highly mastered stroke, the circle does not allow for a change of heart. Murakami executes the Ensō in his unique style, using spray paint over his signature accumulations of flowers and skulls. The Ensō is a true homage to Japanese tradition, a return to a more unfettered minimalist practice – the result of a complex artistic and spiritual path. Takashi Murakami, who has a PhD in Nihonga painting, combines the most cutting-edge techniques with the precision and virtuosity of traditional Japanese art. Inspired by manga and kawaii culture, his irresistible world is peopled by monstrous and charming characters alike, as facetious descendants of past myths. His theory of the Superflat aesthetic, which he introduced in 2000, attempts to blur the boundaries between popular art and high art; it has explored the evolution of Japan’s understanding of its post-Hiroshima condition and the interrelationships between vanguard art, manga, anime and their forerunner, Ukiyo-e wood engraving. The absence of perspective, the two-dimensionality of ancient Japanese art, filters in to every medium. Since his first monographic exhibition outside Japan in 1995 at Galerie Perrotin, Murakami has become recognized as one of the most prominent contemporary artists of his time, and his work has been featured in numerous solo exhibitions at museums and art institutions throughout the world. In 2010, France’s renowned Château de Versailles organized an important solo exhibition of his works on the palace grounds. In 2012, a retrospective entitled “Murakami-Ego” was organized by QMA at Al Riwaq Exhibition Hall, Doha, Qatar and included the 100m masterpiece painting “The 500 Arhats”. In addition to the Mori Retrospective and Ensō exhibition, Murakami’s own personal art collection will be unveiled for the first time at the Yokohama Museum of Art from January 30 to April 3, 2016, in a show entitled “Takashi Murakami’s Superflat Collection ―From Shōhaku and Rosanjin to Anselm Kiefer―”. On the occasion of this Pop Up exhibition, Galerie Perrotin is lauching a 128 page monograph with a text by Mari Hashimoto and forewords by Takashi Murakami and Emmanuel Perrotin.